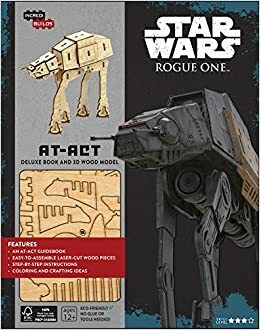 Build your own AT-ACT, as seen in Rogue One: A Star Wars Story, with this IncrediBuilds: Star Wars model kit, featuring a full-color book with facts and trivia on the Empire’s fearsome walkers! Build and color your own 3D AT-ACT model and learn all about this amazing new vehicle from Rogue One: A Star Wars Story in this deluxe IncrediBuildsTM book set. The Empire’s fearsome AT-ACT is yours to build and personalize in this exciting wood model set. The deluxe 32-page hardcover book is packed with information on the AT-ACT’s design and capabilities—including detailed diagrams and schematics—and filled with amazing imagery from the Star Wars films. It also features information on other walkers from the Star Wars universe, including the AT-AT and the AT-ST. The wood model is easy to assemble and snaps together to form a dynamic, displayable 3D version of the AT-ACT that fans will love.